We've outlined some simple tips for RV Awning repairs. Awnings are a wonderful amenity for your RV. The variety of different types including window, door, patio awnings and slide covers which keep debris from getting into your RV. A little preventive maintenance and cleaning should maintain your awnings, but if you own your RV long enough you will most likely need to repair or replace worn out awnings. You should inspect your awnings regularly for wear, tears, stains, or mildew. Vinyl awnings are especially prone to mildew if they are retracted for long periods or wet. Most can be cleaned with mild soap & water and a soft brush. Don't forget to inspect the knobs, hinges, springs, and rivets to ensure they are intact and working properly before extending. Use an anti-rust lubricant like WD-40 to keep the arms running smoothly. 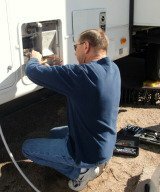 Check to ensure that all mounting hardware is properly affixed to your RV. If you have damage to your awning you can replace the fabric or any of the hardware without installing an entirely new awning. However, if you have a manual awning that is worn out you might want to consider replacing it with an automatic one which can be retracted quickly in case of sudden wind or rain storms. Simple repairs to tears in your awnings vinyl fabric can be done using RV Awning Repair Tape. If you have serious damage to your awnings major repairs are best left to the experts. It can take three to four individuals to completely replace an awning, and correctly set the tension without causing injury to anyone. Trying to do it yourself can be very challenging. 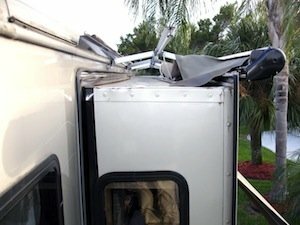 If your searching for how to repair RV awning yourself - you should know it can be dangerous. You should never attempt to remove the end caps on your awnings because the spring tension can cause severe injuries. The springs are locked with a cotter pin to maintain the tension and considerable force in the awning spring can easily break a bone if it gets away from you.